We are trying to list the most FAQ you may ask and list the answers. If you have any other question other than below, please do not hesitate to contact us! 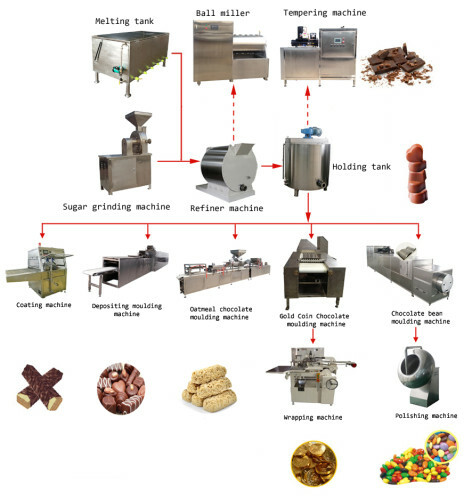 Below is the typical production flowchart of chocolate products. a. If you want to purchase chocolate mass preparing machines, like sugar grinding machine, chocolate melting machine, chocolate conching machine, chocolate tempering machines and chocolate holding tanks, you just let us know what’s your request of the production capacity. If you already have part of those machines and want to buy a certain kind of machine, then the bought machine shall match with other machines. If you don’t know how to decide the size of machine, please consult us. b. If you want to buy the chocolate products making machines, like chocolate coating machine, chocolate moulding machine, chocolate panning machine, chocolate wrapping machine, etc., please show us or describe the end products you want to make, then we will choose and customize the right machines based on our experience. Step 4: We start the production after getting your down payment according our contract within the lead time. Step 5: If product check before delivery is required by you, we will inform you the inspection time after the production is finished. Step 8: If on-site installation and debugging is needed, our engineer will go to your factory after the machine arrives. Yes, our professional engineers can provide on-site installation and debugging service if you ask. How Much Will Be Charged If An Engineer Is Needed For Installation And Installation and Debugging? If on-site installation and debugging service is needed, you need to provide round-trip ticket, board and lodging, and the labor cost of $80 per person per day for our engineers. Do You Provide Warranty To Your Machines? If Yes, Then How Long? We provide one year warranty after delivery to our machines. For chocolate mass preparing machine, like sugar grinding machine, chocolate melting machine, chocolate refiner machine, chocolate holding tank and chocolate tempering machine; and also for chocolate polishing machine, the typical production time is about 25 days. In some cases, we can even shorten it to 20 days. And for the chocolate refiner machine, in most of the cases, we will have stock, so we can deliver once we receive the payment. For chocolate coating machine, the typical production time is about 40 days. For chocolate moulding machine, the typical production time is about 70-90 days. Can We Be Your Agent? How? We are grateful to cooperate with any aspiring company who aimed to devote themselves into the business of chocolate machine. Please contact us for details. How Is Your Price And Quality? We are aimed to provide the best product with the best price and the best quality. Our price maybe not the cheapest in the whole industry, but we are the cheapest for the same quality level. And we provide the best quality for the same price range.